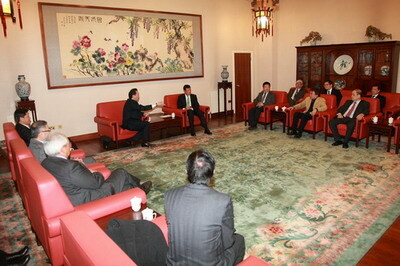 On May 28, 2013, Ambassador Liu Xiaoming met with all the members of the Executive Committee of the Confederation of Chinese Associations UK. Honorary Life President Wen-Hsing Lee and President Ye Jianqiao introduced the general election and future working plan of the Confederation of Chinese Associations UK. 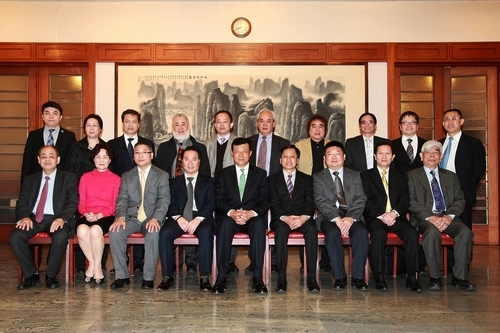 Ambassador Liu congratulated the newly elected executive committee and expressed his appreciation for the contributions which the Confederation of Chinese Associations UK has made throughout the years in safeguarding the rights and interests of overseas Chinese, seeking the well-being of overseas Chinese, enhancing the patriotism and unity of Chinese communities, disseminating Chinese culture, promoting the peaceful reunification of China, facilitating the friendly people-to-people exchanges between China and the UK and supporting the Chinese Embassy's work. Ambassador Liu introduced the general situation of today's China-UK relations and the new situation faced by the Chinese communities in the UK, hoping that, under the leadership of the new Executive Committee, the Confederation of Chinese Associations UK may continue to carry forward its fine traditions, promote the solidarity of Chinese communities, serve the overseas Chinese, constantly improve its representativeness and cohesive force. In addition, he hopes that while the association continues to progress and develop, it may actively expand the exchanges with the mainstream British community and make new contributions for developing China-UK friendly relations and caring for and supporting China's economic and social development. Ambassador Liu said the Chinese Embassy will uphold the concept of "people-oriented diplomacy" as always and wholeheartedly provide high-quality services for the career development and family happiness of overseas Chinese in the UK. President Ye said that the Confederation of Chinese Associations UK will live up to Ambassador Liu's expectations in extensively uniting the Chinese communities across the UK, carrying forward Chinese culture, promoting the friendly-exchanges between China and the UK, striving to elevate the position and image of Chinese communities in mainstream British society, and contribute to the great rejuvenation of the Chinese nation and the realization of the "China dream". At the end, Ambassador Liu took a group photo with all the members of the new Confederation of Chinese Associations UK Executive Committee.